Maggie Smith clutches a pair of glasses throughout her 100-minute monologue in A German Life. She holds them in her right hand mostly, but never puts them on: they’re more decoy than accessory. As Brunhilde Pomsel – who worked as a secretary to Goebbels during the war, and whose reminiscences are the basis of this play by Christopher Hampton – Smith feints and dithers, quavers around remorse and memory. She never quite lets the memory come into focus. She never puts on the glasses. Pomsel lives in a Munich care home, and Smith spends the play sitting at a table and addressing us, her unseen interviewer. The actor doesn’t so much draw us in as literally draw close without us noticing. The wooden floor in Anna Fleischle’s cunning design inches imperceptibly forward until by the end Smith is at the front of the Bridge Theatre’s thrust stage. 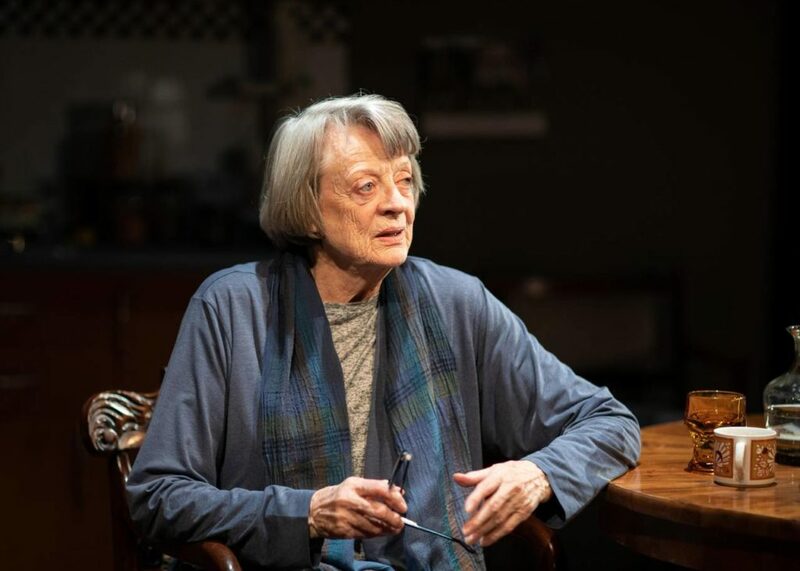 Maggie Smith’s voice – witty, snide, imperious – has always led her arsenal. She slides under lines and then flips them out like pancakes. Instinctively funny, she has to quash our giggles at words like ‘vacuum cleaner.’ Now 84 – and absent from the stage for 12 years – Smith teases any anxiety that her memory may not be up to it. Pomsel begins by apologising for her faulty recall, and Smith pulls at pauses, dithers over details, at times sounds as if lines are slipping through her fingers. Are the glasses there in case she needs to reach for the script? It’s like watching a tightrope virtuoso deliberately make the wire wobble, yet remain aloft. Pomsel spent much of the war in Goebbels’ propaganda unit. She is a witness to history who doesn’t, can’t, recognise what she saw. She didn’t read the papers that came across her desk, she says, even though she typed them. Her proudest achievement is not reading a file about the brutal execution of Sophie Scholl, who led an ill-fated resistance movement against Hitler. Details escape her, but she never forgets how much she earned. She joins the party (to secure a job, she says) but is vague about the extent of Jewish persecution. Her best friend disappears, and she doesn’t let herself wonder where. What she knew – what she allowed herself to know – is always lost in the mist. ‘Incomprehensible’ is a word she falls back on – for example, to describe both her first Jewish boss, and a boyfriend’s articles for the Nazi press. Pomsel boasts of how smart she was at school and how she excelled in shorthand – but also insists she was far too stupid to understand politics, even as she was at the heart of the political machine. She declares she decided to tell the truth to her Russian interrogators after the war, only to lie about not really meeting Goebbels – even though she had sat beside him at a dinner party in his home. Is she aware of her contradictions? Can’t she just put on the damn glasses? The banality of evil may be an over-worked concept. Hannah Arendt’s phrase, coined to define the petty focus of Hitler’s bureaucrat, Adolf Eichmann, itself now risks banality. Here the mundanity of many of Pomsel’s recollections (canteen chats, mending ladders in stockings) does more than flirt with dullness. She doesn’t distinguish between the horrors of genocide and her pleasure in knowing a little woman who can adjust a borrowed outfit. Her work doesn’t directly cause death (or does it? ), but she contributes to death’s work. I’m not sure if the play and Jonathan Kent’s production are always in command of their ambiguities. Throughout, as the monologue’s meander becomes pointed towards the war’s end, Pomsel will often refer to ‘we’. What ‘we’ thought or felt, or didn’t. ‘We’ sometimes suggests family, or colleagues, or the entire non-Jewish German population. It’s another decoy: for every we there’s a they, for every us an other. But must the audience become complicit in Pomsel’s ‘we’, her convenient myopia and refusal of remorse? Smith, a revered star, isn’t courting approval. Smith has rarely taken on political drama. She’s more often seen in period costume – Shakespeare and Restoration drama on stage, Hogwarts and Downton on screen. She is celebrated more for the play of personality than the parsing of ethics. So it seems significant that she for this late stage appearance she selects a role deep in the moral murk. At times, when Pomsel can’t but acknowledge the human cost of the Nazi programme, Smith puts anguished hands to her eyes, grasping the glasses tightly. But even so, she doesn’t put them on.